I am not a quilter. While I appreciate the time and talent that goes into making a quilt, I’m just not visually drawn to them and I find quilt fabric unappealing. Until last year. 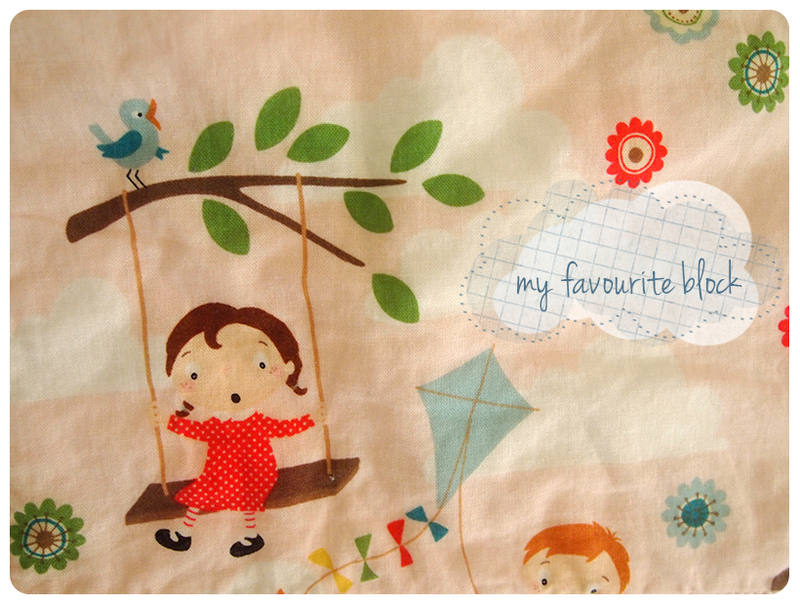 I came across a blog called Film in the Fridge, where I was introduced to modern quilts with awesome fabric. After a couple of late nights finding the cutest quilts ever, I felt the need to make a quilt. 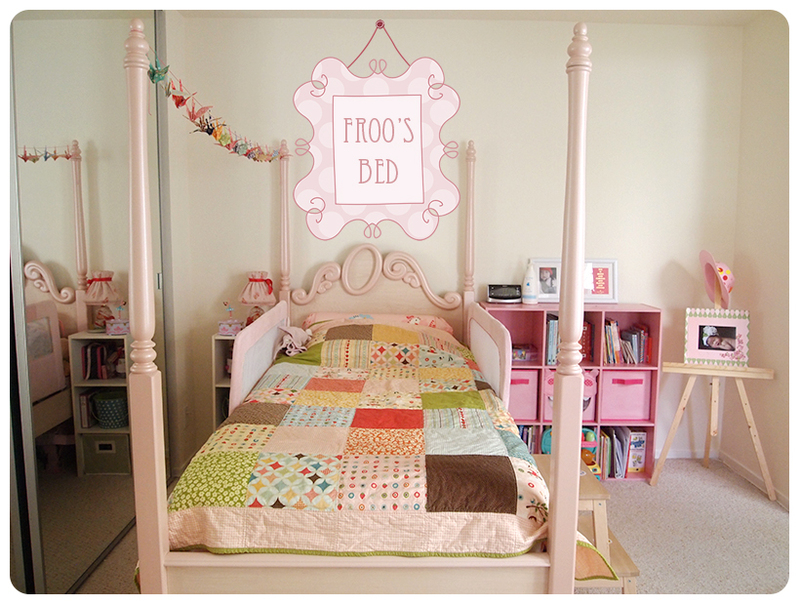 When I saw the fabric line, “Fly a Kite” from October Afternoon, I knew I had to make a quilt for Froo. I’ve liked this design ever since it came out as scrapbook paper. The colour palette includes both soft and contrasting colours, the illustrations are adorable and it matches Froo’s bed–which is important because anything other than pink would be unacceptable. After basting together the patchwork top, batting and backing, I wasn’t sure how I was going to quilt it. I went to my local quilt shop to find out how much it would cost to have it professionally quilted. The answer I got was, “between $100 and $1000”. Whaaaat? Suddenly, the cute Pottery Barn Kids quilts seemed like a steal. So I went back home and quilted it with straight-ish lines a little less than 1/4 inch from each seam. Not all of my squares met up as perfectly as shown in the photo below. It was a little tricky fitting the quilt through the machine, which explains why my stitch width isn’t always even. I decided to machine bind my quilt because I don’t have the patience for hand sewing. It came together really fast! 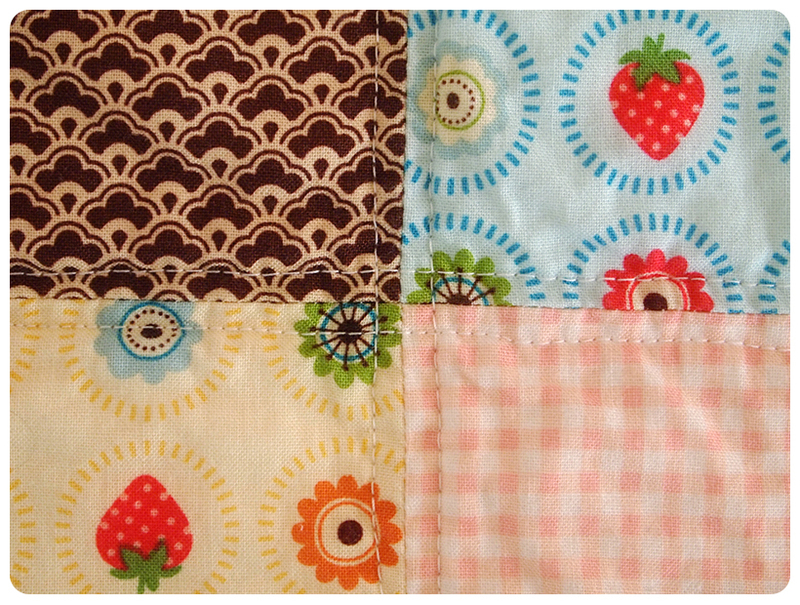 The backside of the quilt is also from October Afternoon, but from their Farm Fresh line. The pink is not exactly the same, a little more peachy, but I loved the look of random white lines. 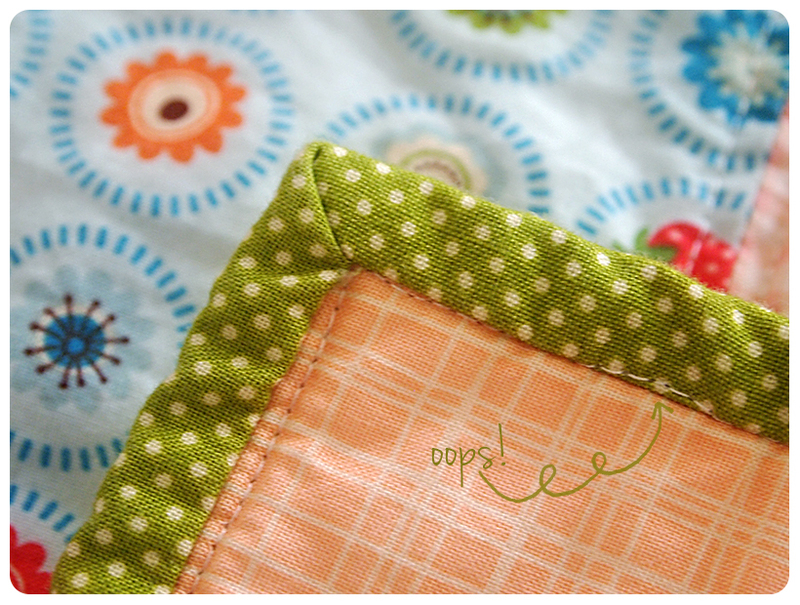 I thought it would hide any imperfections in my quilting! I made a couple of mistakes, but I didn’t bother to fix them. I love how it turned out, but I still wouldn’t call myself a quilter. 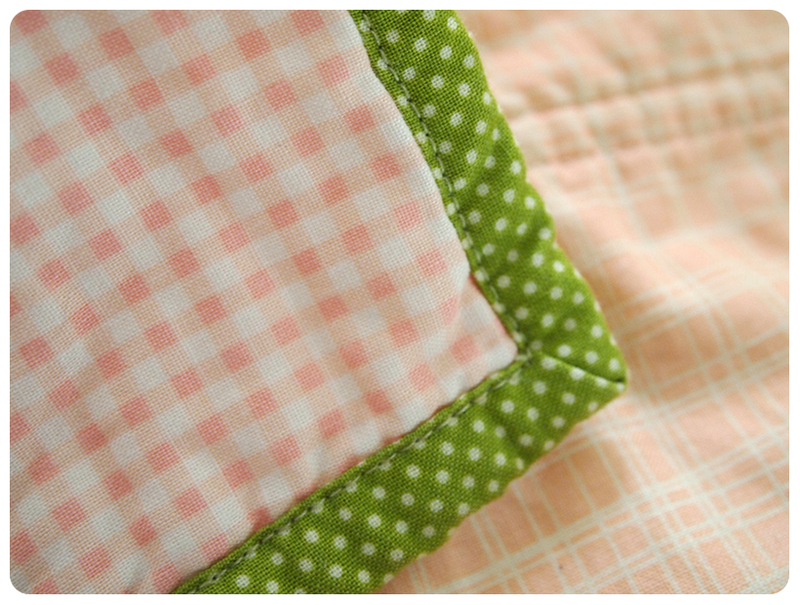 Just someone who dabbled in quilting once because the fabric was too nice to resist. 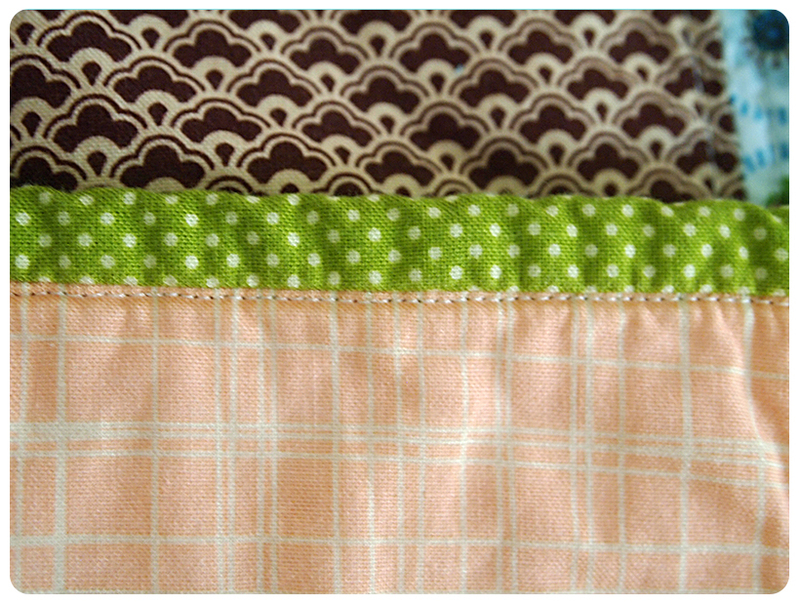 The next quilt I make will be for Boo, the fabric is just as adorable. It’s sitting in the same clear tote bin that Froo’s fabric was in. If we get more house guests, perhaps I will get started on it. 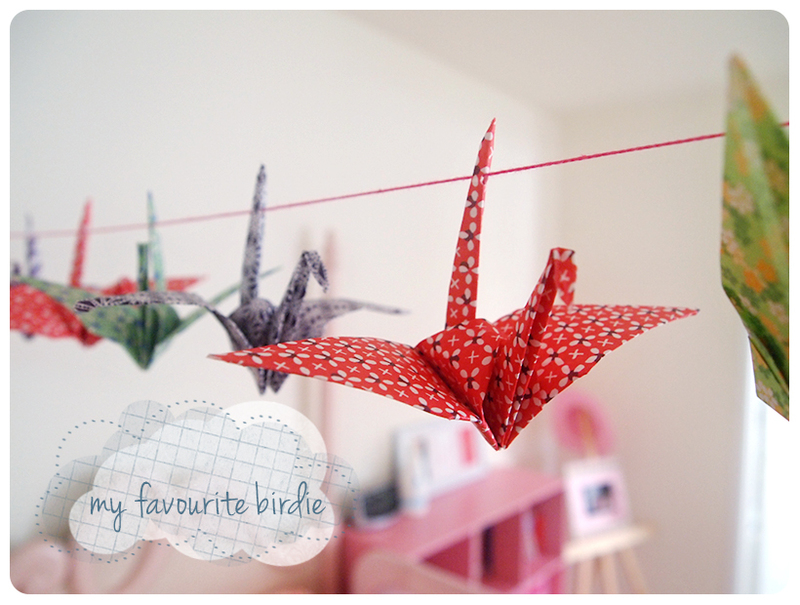 As for the paper birdies, Froo asked me to make her some. She was fascinated when I made her one out of a paper placemat at a Chinese restaurant. 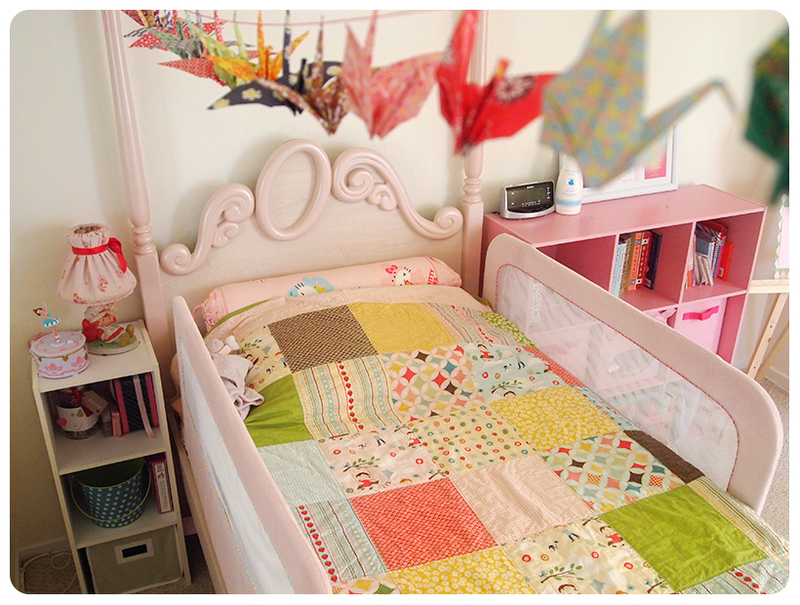 We usually do crafty things while Boo naps, so I took out my origami paper and made some cranes. The paper is over 9 years old–purchased in Japan while the hubs and I were still dating. I’ve been saving it for all of these years, not knowing what for, until now. The crafty time I spend with Froo is one of the favourite parts of my day. LOVE the quilt! You never cease to amaze me. I can’t wait for more posts!!! Your works look awesome! I can’t wait to see more of your fun products !